Let’s first set the stage. 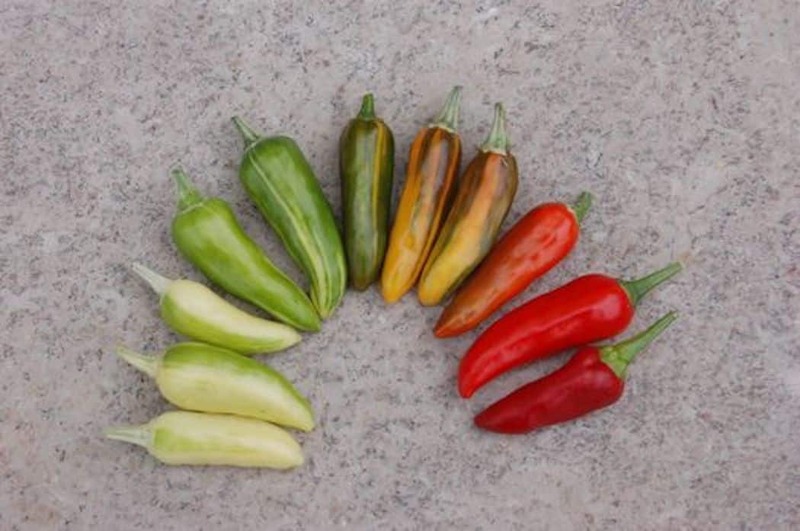 All peppers are colorful – it’s one of the beautiful things about this fruit – but our colorful peppers guide covers the real rainbows of the pepper scale. These are the chilies that spring forth in multiple bright hues, adding real vibrancy to a garden or landscaping. Most of the hot peppers on our list are considered ornamental peppers, though there is a notable exception (see fish pepper). 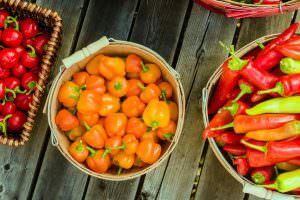 If you want to explore the full world of ornamental color, take a look at our ornamental peppers guide. There you’ll find a world of rainbows, blacks, and everything in-between. See our full Medusa pepper profile here. With fruits that age from ivory white to a sultry red, and a world of oranges and yellows in-between, the Medusa pepper is a colorful looker. The chilies grow in clusters and straight up from the vine, reminiscent of Medusa’s serpent mane. It looks like it should be a much hotter chili, but the Medusa pepper is rather tame, with heat closer to a zero heat sweet pepper (and a flavor to match) than a jalapeño. See our full Chilly chili profile here. Yellows and reds dominate the Chilly chili, though in-between it can take on multiple hues of orange. It’s a burst of color in the garden, with the fruits reaching up from the plant in clusters. And like the Medusa pepper, it’s a milder ornamental pepper, though without the Medusa sweetness. 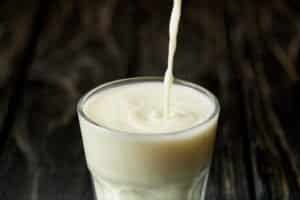 It’s more neutral in taste – peppery but without much nuance. See our full NuMex Centennial profile here. 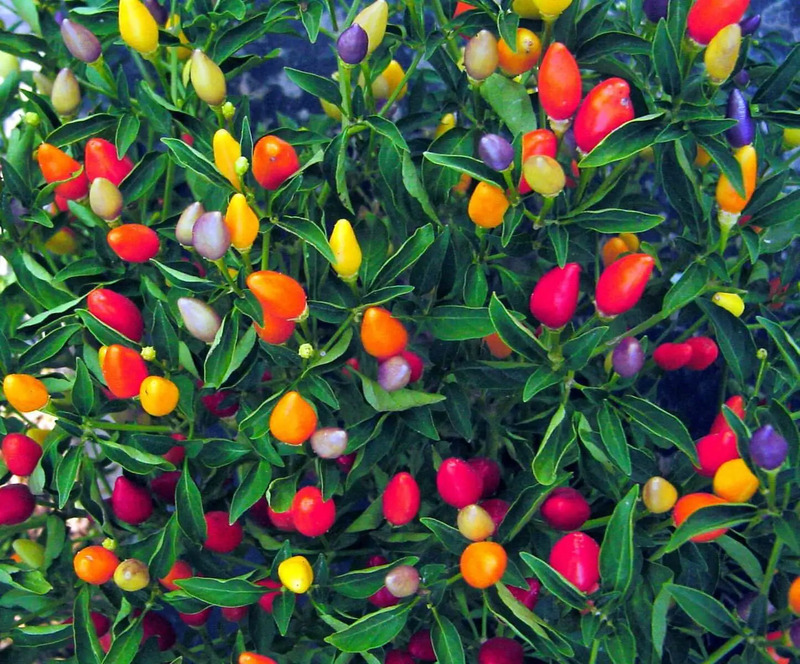 These small bulbous chilies are like colorful Christmas lights on a plant. The NuMex Centennial ages with jewel-tone hues of purple, orange, red, and yellow. There’s a spiciness here that reaches that of a jalapeño pepper, but like with other ornamentals the flavor is rather neutral – secondary to the colorful scene the NuMex Centennial paints in your landscaping. See our full fish pepper profile here. 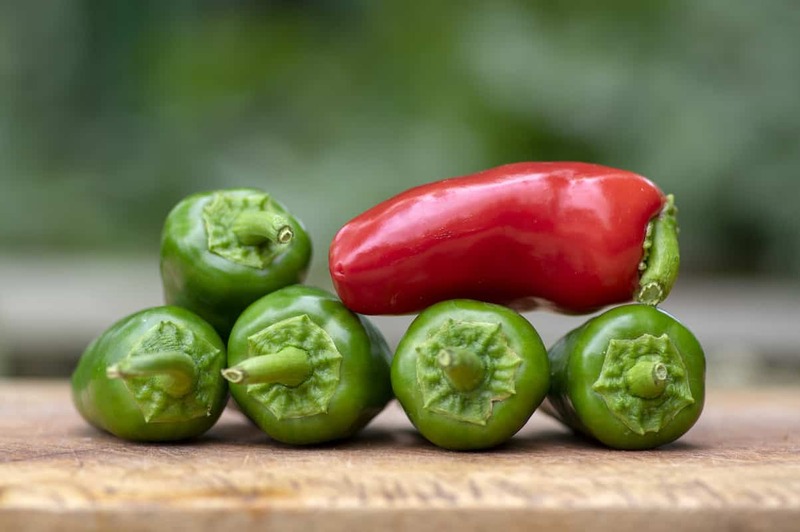 The fish pepper isn’t an ornamental pepper, and it’s not as bright as some of the other chilies on our colorful peppers list. But it’s coloring is still quite unique for the pepper scale. It ages from white to green, then green to shades of orange, brown, and finally red. 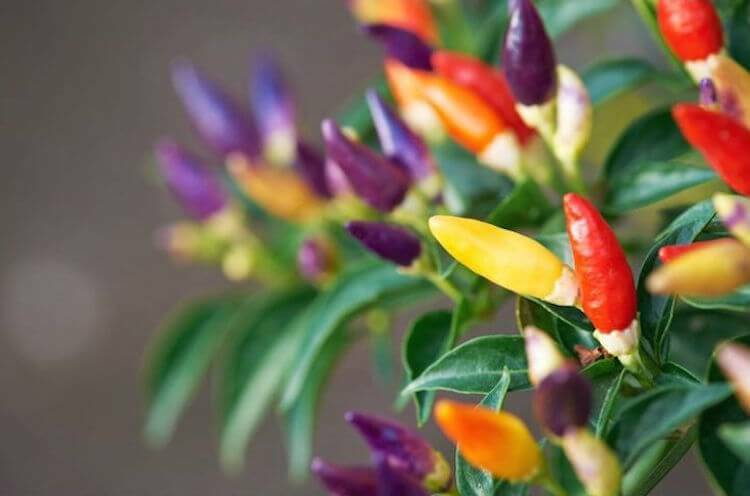 The colors are striated on the pepper causing the chilies to appear in multiple colors on a singular pod as they age. Fish peppers are loved for their flavor – fresh and bright like a jalapeños, with a heat that ranges from jalapeño to a mild cayenne. 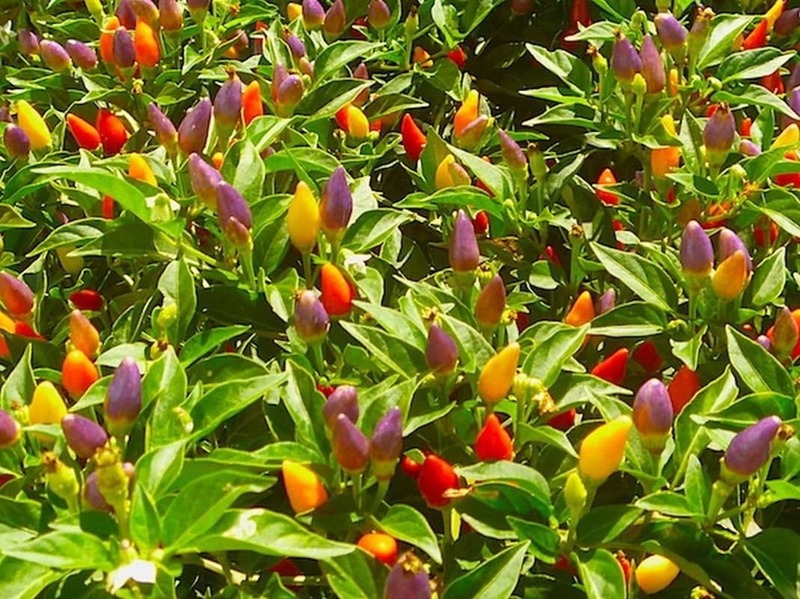 See our full Bolivian rainbow pepper profile here. 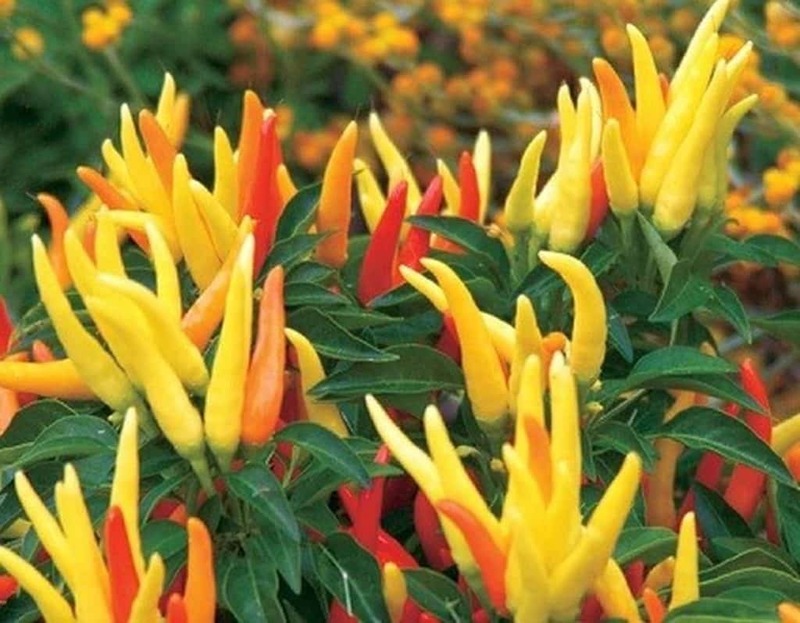 Arguably the most vibrant colorful pepper on the list, the Bolivian rainbow pepper ages from purple, to shades of yellow and orange and finally red. The colors are Easter-like, somewhere between pastel and jewel-tone that make the fruits look a little candy-like. 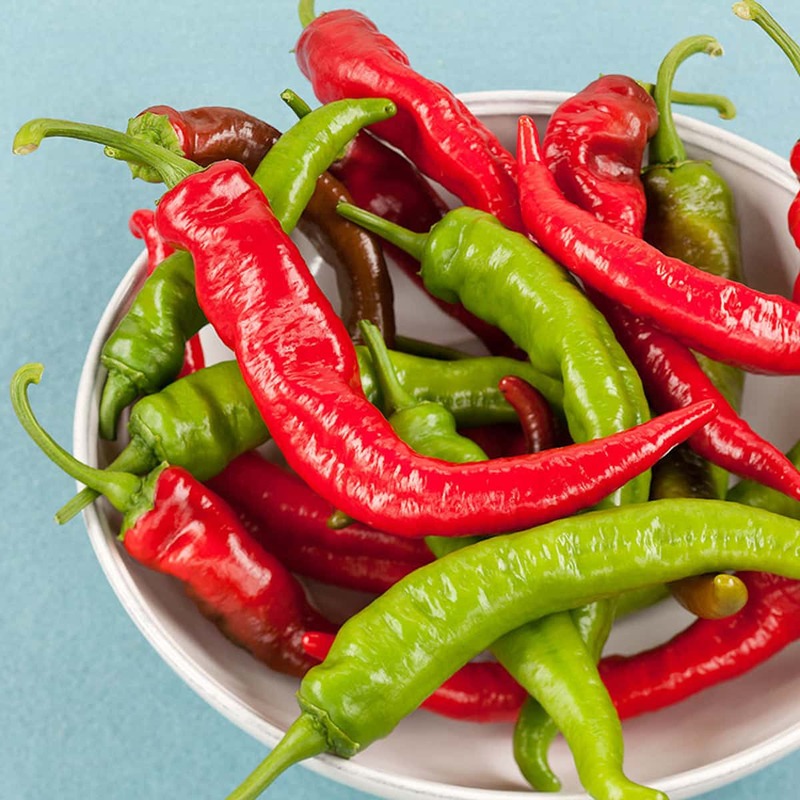 Though the heat is nothing like candy – ranging from serrano pepper spiciness to the heat of a mild cayenne pepper. Flavor-wise – it’s neutral in taste (like most ornamentals), with peppery taste that leans a little into grassy. 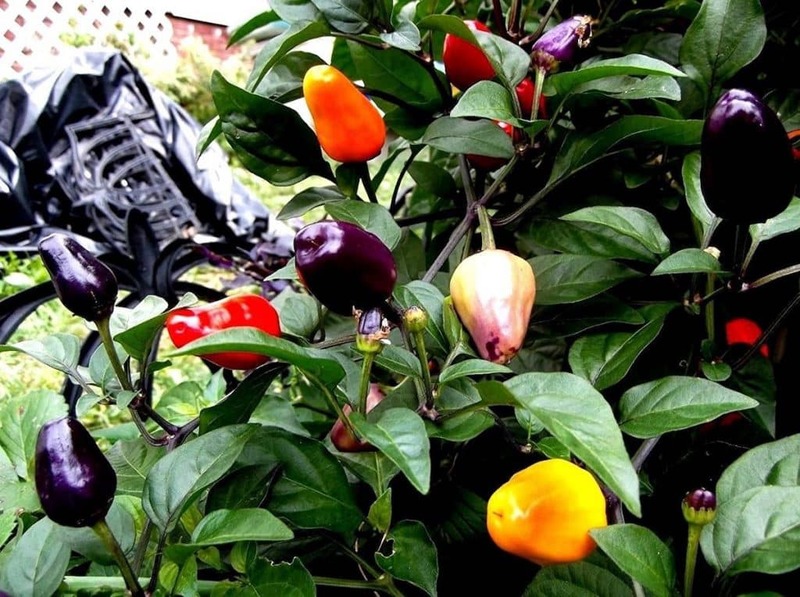 See our full NuMex Twilight pepper profile here. Like the Bolivian rainbow pepper, the NuMex Twilight brightens up a space with shades of purples, yellows, oranges, and reds. They could compete well with the Bolivian rainbow for the title of most colorful pepper – though they hit in a different weight class in terms of heat. They have the same heat profile as a cayenne pepper, which may be too hot for some. The NuMex Twilight also has more a salty, bitter flavor which doesn’t make it a great culinary choice. Still, it’s all about the colorful looks which this chili has in spades. See our full Aji Omnicolor profile here. 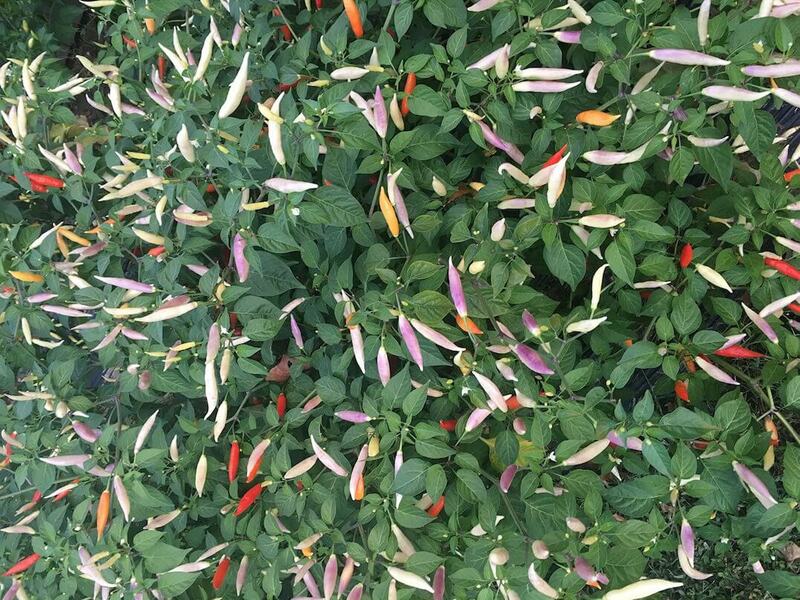 The whites and light purples that are mixed in with the oranges and reds of the Aji Omnicolor bring a pastel-like softness to the color palette of this plant. 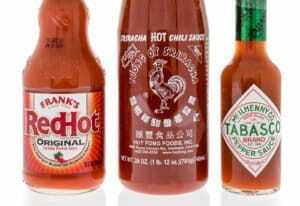 Those light hues belie a significant medium heat, the same Scoville heat rating as a cayenne pepper. 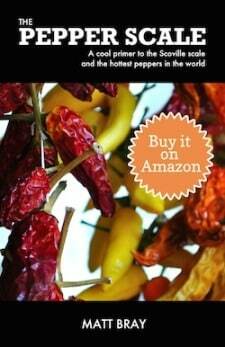 Best of all, these are quite flavorful chilies, particularly for an ornamental pepper – sweet and fruity. They are delicious for a colorful salsa. See our full Chinese Five-Color profile here. 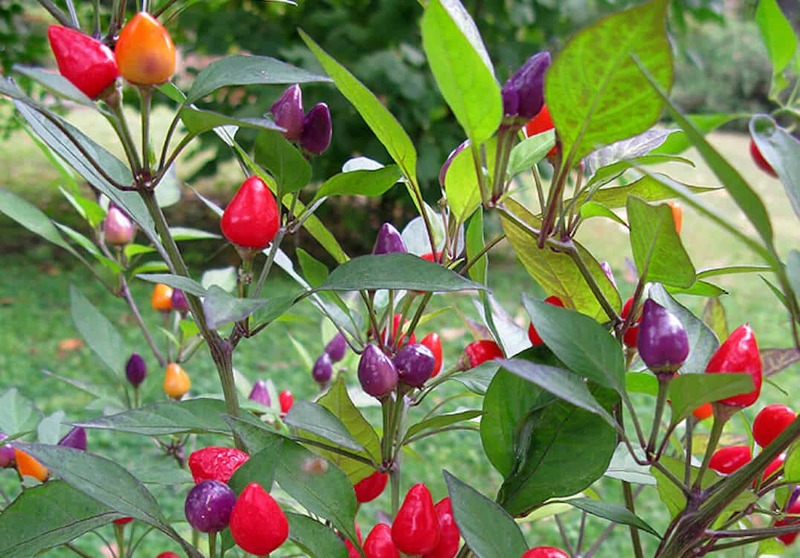 Chinese five-color peppers are tiny conical chilies that pop in landscaping. What to expect from this chili is all in the name – five colors star: purple, cream, yellow, orange, and red. 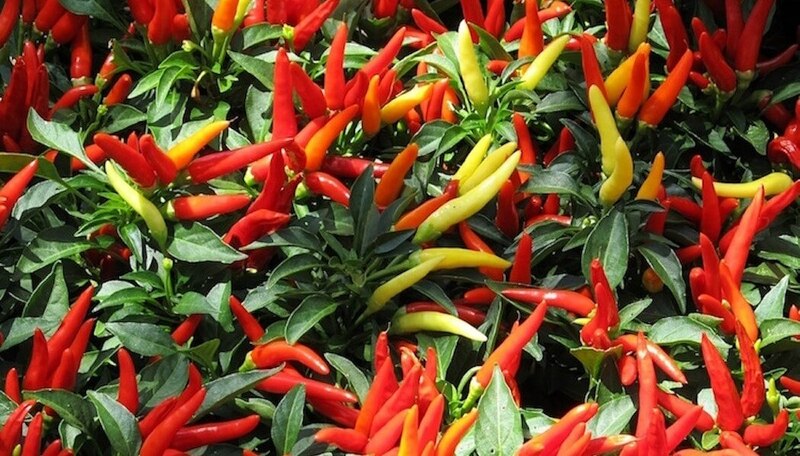 Their heat equals that of a cayenne pepper, and there’s more flavor here than you’ll find in other ornamentals. There’s a fresh peppery sweetness. It’s not overly complex, but certainly tasty. See our full prairie fire pepper profile here. Known also as Christmas peppers, prairie fire peppers are tiny, pendant-shaped chilies that show a lot like Christmas lights. 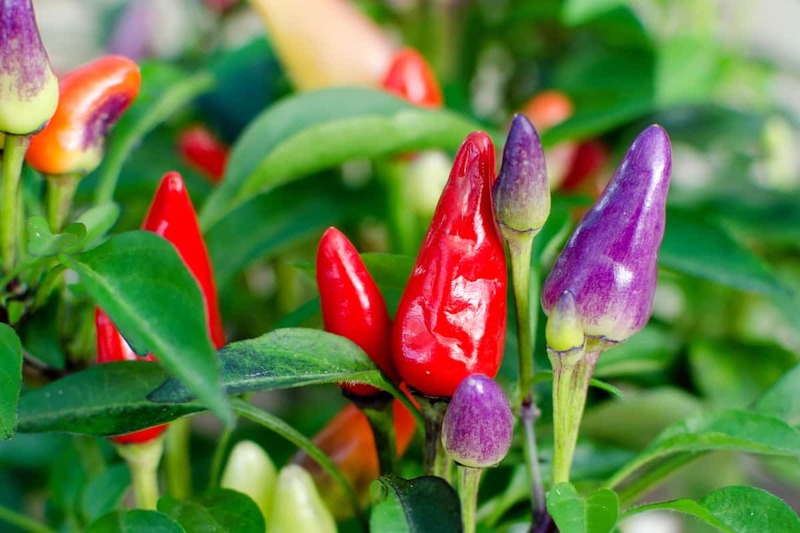 Bright purples, reds, yellows, oranges, and creams cover the plant making them another contender for the most colorful pepper on the list. The flavor is rather pepper-neutral, but there’s quite a bit of heat here with a spiciness that rivals Thai peppers. They make a mean colorful salsa while not brightening up your garden.